For the rest, make a bow out of the ribbon. Tie a knot in the thin red ribbon. Make a bundle out of the tulle. Layer it all together and tie the thin red ribbon (with knot in front) around the bundle. Use hot glue where necessary. Then hot glue the bow to the top of the headband, in between the ears. Fun, right?!?!... 17/03/2008�� I wanted to make a Minnie Mouse bow for my daughters to match a shirt. I bought a huge bag of wooden shapes at Hobby Lobby and chose to a large wooden circle & 2 smaller circles. I glued them together & painted them black. 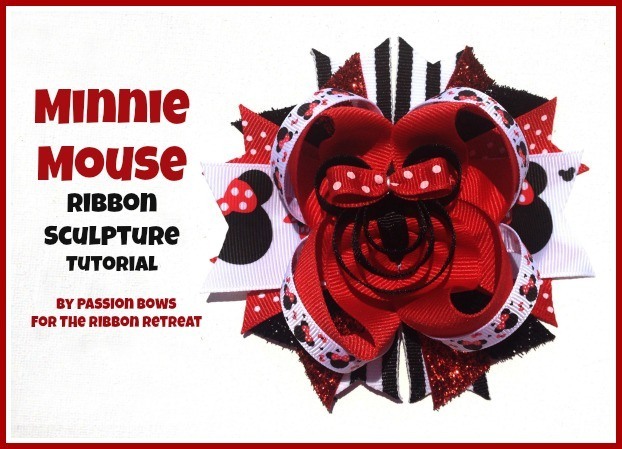 Then I took a small ribbon & made Minnie's ribbon. I glued in on a clippie that I lined with ribbon. I also plan to do this on a bow.